Rediff.com » Business » Vote: Who has been India's best finance minister yet? Vote: Who has been India's best finance minister yet? Finance Ministers play a key role in shaping the economy of a country. While Palaniappan Chidambaram holds the distinction of presenting the maximum number of Budgets -- seven in all (two under the United Front government and five under the United Progressive Alliance regime), both, Manmohan Singh and Yashwant Sinha have presented five Budgets each. India's finance ministers ushered in financial reforms and steered the economy out of crisis over the years. 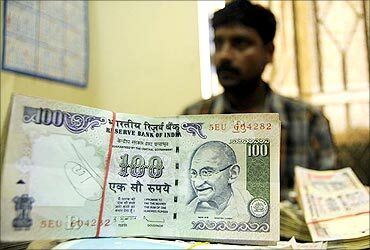 Despite the slowdown in the global economy, India's GDP growth is set to hit 8.6 per cent this fiscal. Who needs to be credited for the growth of Indian economy? Click NEXT to know more about the men who were instrumental in India's economic success and VOTE for the Best Finance Minister till now! Image: FMs help in economic growth. R K Shanmukham Chetty was the first finance minister of Independent India. On November 26, 1947, Chetty presented India's first budget after Independence. Liaquat Ali Khan - who became the first prime minister of Pakistan - had presented the budget in 1946-47 of the interim government before the final creation of India and Pakistan as two separate nations. Chetty was an economist, an experienced administrator and an ace orator. However, his term as finance minister did not last long. In 1949, Chetty resigned due to differences with Prime Minister Jawaharlal Nehru. He was succeeded by John Mathai. Image: R K Shanmukham Chetty. John Mathai was India's first railway minister and later became the finance minister. He took office shortly after the presentation of India's first Budget, in 1948. He presented two Budgets, but resigned following the 1950 Budget in protest against the idea of setting up the Planning Commission. Mathai graduated in economics from Madras Christian College. He was followed by C Deshmukh as India's finance minister. Chintaman Dwarakanath Deshmukh was the first Indian Governor of the Reserve Bank of India from August 11, 1943 to June 30, 1949. He was India's finance minister from 1950-56. Image: C D Deshmukh (inset). 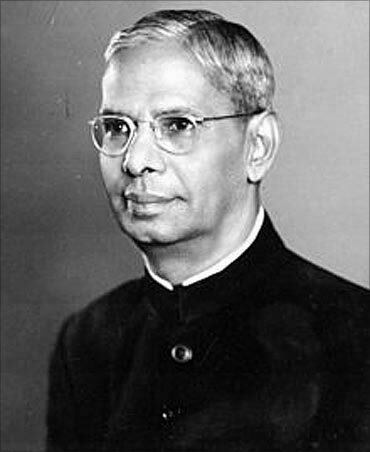 Popularly known as TTK, Tiruvellore Thattai Krishnamachari was India's finance minister from 1957-1958 and 1964-67. He resigned from the the post of finance minister during the period. Prime Minister Jawaharlal Nehru took over the country's finance portfolio during 1958-59. In 1964, TTK was again sworn in as finance minister. He, however, resigned again when his term as member of Parliament was over, preferring to quit politics and indulge in intellectual pursuits. Image: T T Krishnamachari (inset). 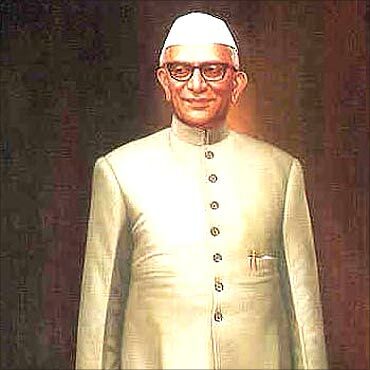 Morarji Desai was the finance minister of India from 1959-64, 1967-70 and for the third time between 1977 and 1979. He also served as prime minister from 1977 to 1979. From 1964-1967, TTK took over the crucial finance minister's position. From 1967-70, it was again Morarji Desai's turn. During his stint as FM, Morarji raised large revenues and curbed wasteful expenditure. He brought about strict discipline in the ministry. He is the only Indian to receive the highest civilian awards from both India and Pakistan - the Bharat Ratna and and Nishaam-e-Pakistan. Indira Gandhi then took over the finance portfolio for a year from 1970-71. 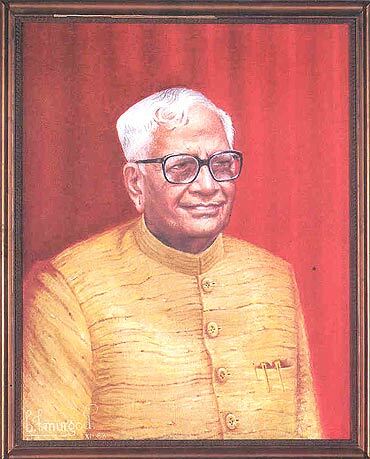 Yashwant Rao Chavan was the finance minister from 1971-1975. He was followed by C Subramanian from 1975 to 1977. 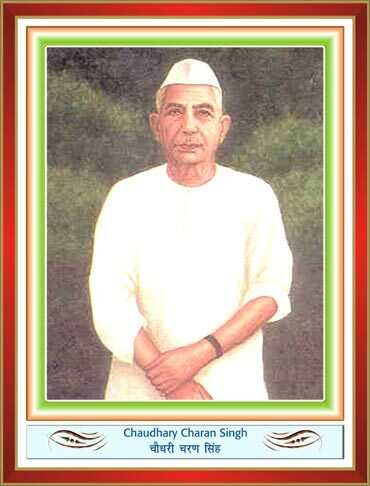 Charan Singh joined the league of prime ministers who also held the finance portfolio. He was the finance minister for a year from 1979 to 1980. He served twice as chief minister of Uttar Pradesh. He played a crucial role in implementing the provisions of the Zamindari Abolition and Land Reform Act. Charan Singh's political career received setbacks as he openly criticised Nehru's Soviet-style economic reforms. Coming from an agricultural background, Singh believed that cooperative farms would not succeed in India. Being a son of a farmer, Charan Singh felt that right of ownership was important to the farmer. In 1980, Venkataraman was re-elected to the Lok Sabha and was appointed finance minister in the government headed by Indira Gandhi. He was later appointed the Union minister of defence, before becoming India's Vice President and then the President. He served as the 8th President of India from 1987 to 1992. He also held various ministerial positions. After graduating in economics from the Madras Uniersity, he pursued a law degree and joined the Madras high court in 1935 and the Supreme Court in 1951. In the finance ministry, Venkataraman was succeeded by Pranab Mukherjee who was the finance minister from 1982-85. He was followed by V P Singh who took charge of the finance ministry during 1985-87. 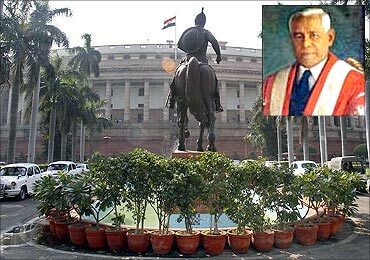 Shankarrao Bhaurao Chavan was elected as the chief minister of Maharastra twice from 1975 to 1977 and from March 13, 1986 to June 24, 1988. Chavan was Union finance minister during 1987-1990. Chavan was also the home minister in the Narasimha Rao Cabinet. He graduated from Madras University and did his LL.B. from Osmania University. Like the current finance minister, P Chidambaram, Chavan too started his career as a lawyer. With good administrative skills and eagerness to work for social causes, he became a leader of the masses. He was followed by Madhu Dandavate who was the finance minister for a brief period in 1990-91. 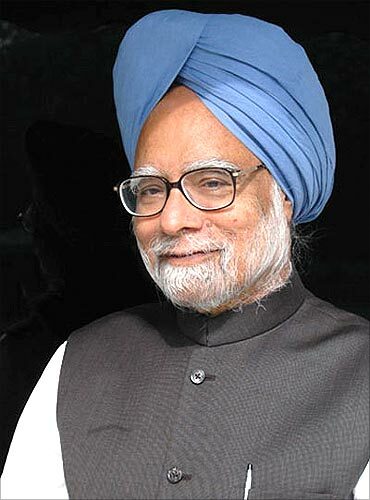 India's 14th prime minister, Manmohan Singh is hailed as the architect of the country's economic reforms. In 1991, the liberalisation process ushered in by the Narasimha Rao government opened India's gates to foreign direct investment. Under Manmohan Singh, the economy flourished, industry growth picked up, inflation was brought under control and growth rates remained high. 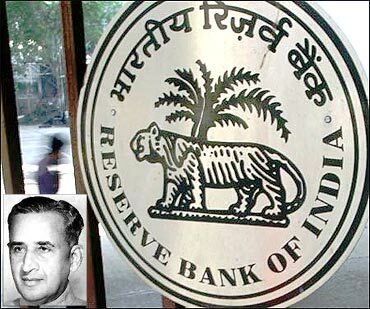 He has also served as an economic advisor to the finance ministry in the late 1970s, deputy chairman of the Planning Commission and chairman of the University Grants Commission in 1980s and early 1990s and as the Governor of the Reserve Bank of India from 1982 to 1985. In the 1996 general elections, the Bharatiya Janata Party emerged as the single-largest party in the Lok Sabha but did not have enough strength to prove a majority on the floor of the Parliament. Under Prime Minister Atal Bihari Vajpayee, the BJP-led coalition lasted in power for 13 days. The United Front government -- a coalition of 13 parties -- came to power in 1996 as a minority government with the support of the Congress party. 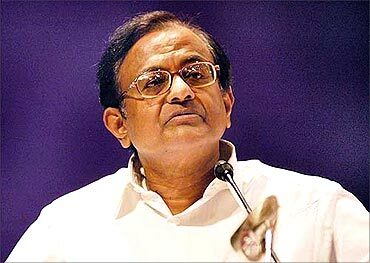 P Chidambaram took over the finance portfolio in the United Front government under the premiership of H D Deve Gowda. This government lasted less than a year, as the Congress withdrew support in March 1997. Inder Kumar Gujral replaced Deve Gowda as the prime minister of the coalition. In November 1997, the Congress again withdrew support to the government. New elections in February 1998 saw the BJP getting the largest number of seats in Parliament. On March 20, 1998, the BJP-led coalition government was sworn in with Vajpayee again as the prime minister. 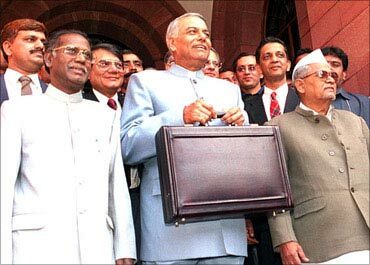 When the BJP came to power in 1998, Yashwant Sinha became the finance minister. Yaswant Sinha held the post of finance minister from March 1998 to July 2002. He then became foreign minister after he exchanged his portfolio with Jaswant Singh. Sinha is credited for pushing through several major reforms that put the Indian economy on a fast track. He lowered interest rates, introduced tax deduction for mortgage interest, opened up the telecommunications sector and deregulated the petroleum industry. 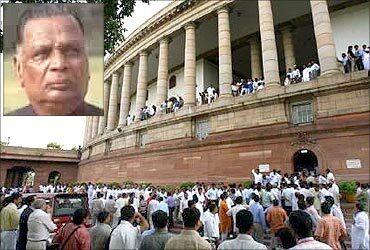 He became the finance minister in the Bharatiya Janata Party government which lasted just a month from May-June 1996. In July 2002, he once again became the finance minister. He held the post till the General Election of May 2004. He played a key role in pushing ahead market-friendly reforms. 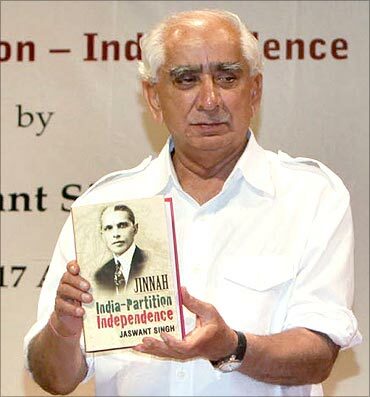 Jaswant Singh was an officer in the Indian Army in the 1960s. He is one of the few Indian politicians to have held the potfolios of defence, finance and external affairs. When the BJP failed to garner the required majority in Parliament in 2004, the Congress-led coalition came to power at the Centre and P Chidambaram became the country's finance minister. Palaniappan Chidambaram has the distinction of presenting seven Budgets. He became the finance minister for the second time in May 2004 in the United Progressive Alliance government. His first stint as the finance minister was from 1996 to 1998. Chidambaran is acclaimed to have carried forward the economic reforms started in 1991 by Manmohan Singh. He is known for his 'dream Budget' in 1996-97, in which he curbed government expenditure and launched an ambitious tax reforms programme to address a huge fiscal deficit. Chidambaram started his career as a lawyer in the Madras high court. 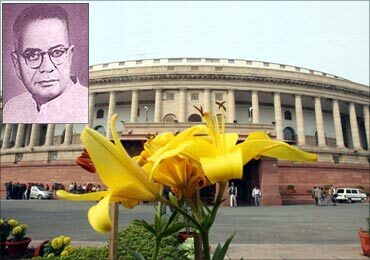 Pranab Mukherjee began his parliamentary career began as a Rajya Sabha member from Congress Party in 1969. His ministerial career begun in 1973 as the Deputy Minister, Industrial Development. He has been in charge of various portfolios like shipping and transport, revenue and banking, commerce, external affairs and defence. When he was the Finance Minister of India during 1982 to 1984, Euromoney Magazine rated him as the best Finance Minister of the world for maintaining fiscal transparency, regulating fuel prices and balancing growth. Mukherjee became the finance minister for the second time in 2009. He introduced tax reforms, scraped the Fringe Benefit Tax and the Commodities Transaction Tax in 2009. 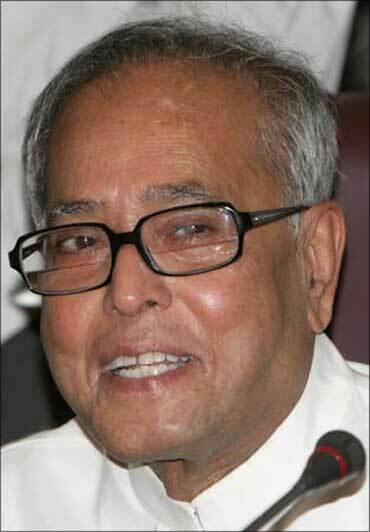 In the 2010 Budget, Mukherjee offered relief to tax payers by changing the tax slabs.